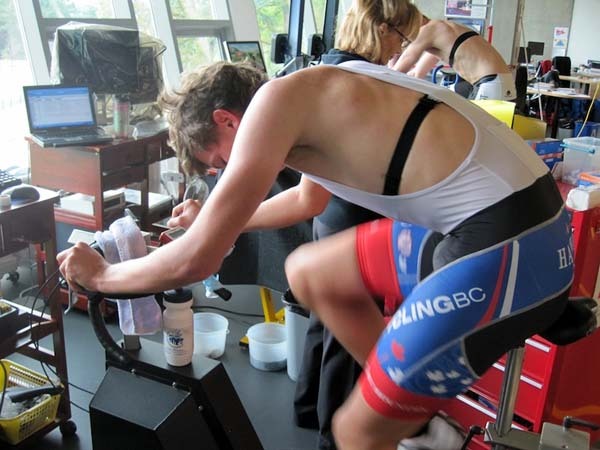 October 7-9 saw the best of BC's junior and U-17 riders head to Victoria for some fun in the Canadian Sports Center Pacific High Performance Lab. Riders were invited based on their performances on the roads, trails and velodrome's around BC at camps and races throughout the 2011 season. 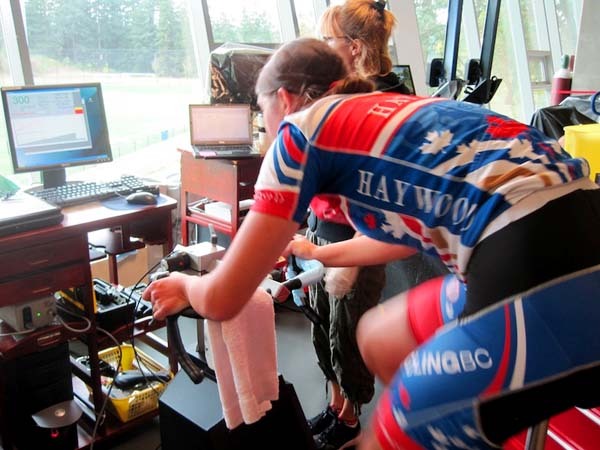 Everyone got to experience the joy and glory of completing the famed Maximal Aerobic Power test on the lab's state of the art SRM testing bike. After a bit of a warm up the riders had an easy start to the test, but with the load increasing every three minutes it soon led to some pain and suffering. Each athletes was also subjected to small blood samples taken at the end of each of the stages to measure the athlete's blood lactate levels. Results were, to say the least, impressive. Many of the guys who raced for Team BC in 2011 scored close to 400 watts and the girls were equally impressive, with some solid numbers showing their potential. We also saw a great deal of determination and hard work as the athletes literally buried themselves in many case to go a few seconds longer and finish the stage even though it was obvious their legs were about to explode! The riders were all quite happy to finish their tests and find the sun waiting for them on a couple of long road rides. This time it was a little head to head testing as the athletes pushed each other to go a little harder out on the road, or maybe they were going that little bit harder to try and drop the coaches who were along for the ride after provide "encouragement" to each rider as they were in the hardest part of their test! Fortunately, Team BC coaches Jeff Ain and Steve Lund have maintained just enough fitness to allow their years of experience to keep them with the group even when most were on the rivet! The girls had a little bonus, when they were joined on their Saturday ride by former pro racer Amy Dearden, who provided some girl specific riding advice. The guys got a chance to ride and chat with Jamie Sparling. Jamie just arrived back in Victoria after a successful season in Europe racing for the Raleigh UK Team (where he will return in 2012), and he provided some great insight to the guys on what it takes to progress through the ranks and ride professionally in Europe. The weather was great and we enjoyed a couple solid 2.5-4 hour rides in and around Victoria. 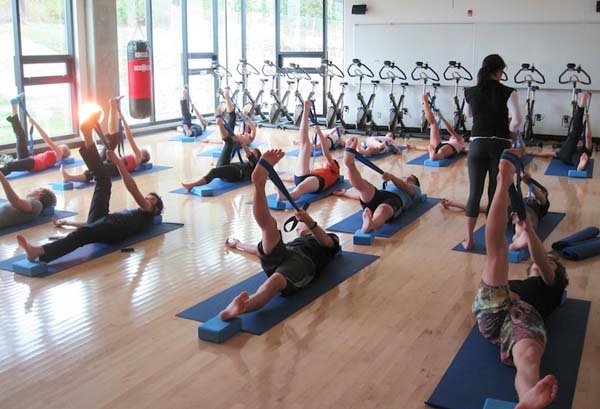 To make sure everyone was up to speed on how to recover from their efforts and maintain perfect health while training and racing there were also sessions on Sport Nutrition and a special Yoga for Cyclists session. 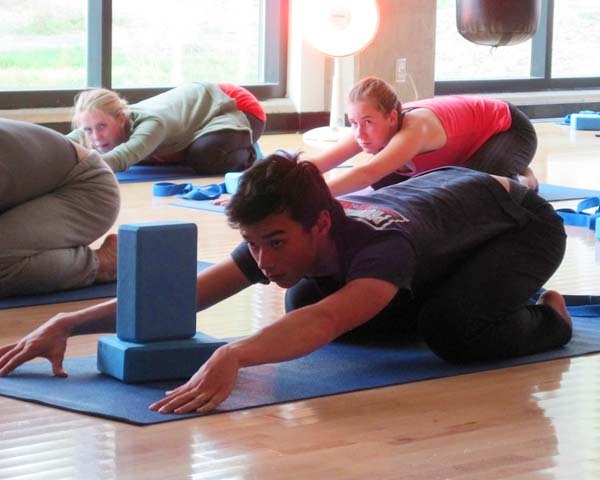 The Yoga session was a great eye opener for many of the athletes, as they discovered the range of their flexibility and how some have imbalances that, with correction, can lead to better performance on the bike. The Nutrition talk led by CSC-Pacific Dietician Sue Boegman covered a wide range of topics, and all of the athletes left the session with a hunger to eat the right foods at the right time both on and off the bike. 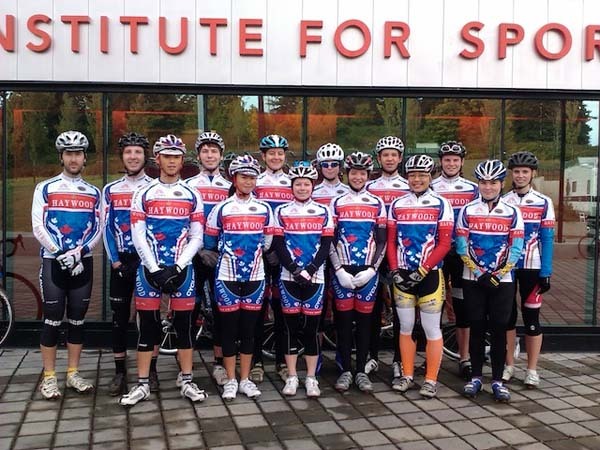 Most of the riders at this camp will be heading to Burnaby in November to work on their track speed and skills at Team BC's next training camp.